Tracing myeloid and erythroid differentiation for data of Paul et al. (2015). WARNING: In Scanpy 0. *, this returned logarithmized data. Now it returns non-logarithmized data. Let us work with a higher precision than the default ‘float32’ to ensure exactly the same results across different computational platforms. Apply a simple preprocessing recipe. drawing single-cell graph using layout "fa"
To denoise the graph, we represent it in diffusion map space (and not in PCA space). Computing distances within a few diffusion components amounts to denoising the graph - we just take a few of the first spectral components. It’s very similar to denoising a data matrix using PCA. The approach has been used in a couple of papers, see e.g. Schiebinger et al. (2017) or Tabaka et al. (2018). It’s also related to the principles behind MAGIC Dijk et al. (2018). This is not a necessary step, neither for PAGA, nor clustering, nor pseudotime estimation. You might just as well go ahead with a non-denoised graph. In many situations (also here), this will give you very decent results. This still looks messy, but in a different way: a lot of the branches are overplotted. 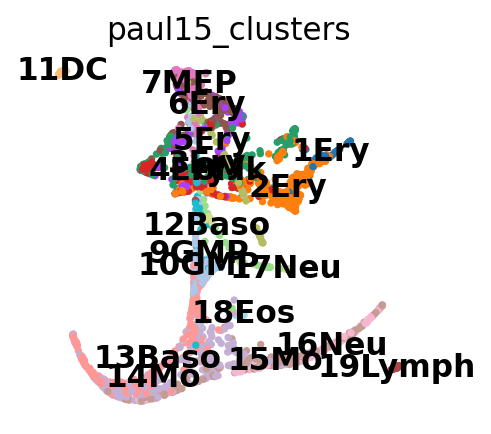 Annotate the clusters using marker genes. For simple, coarse-grained visualization, compute the PAGA graph, a coarse-grained and simplified (abstracted) graph. Non-significant edges in the coarse- grained graph are thresholded away. Actually annotate the clusters — note that Cma1 is a Mast cell marker and only appears in a small fraction of the cells in the progenitor/stem cell cluster 8, see the single-cell resolved plot below. Let’s use the annotated clusters for PAGA. The following is just as well possible for a UMAP. Now we can see all marker genes also at single-cell resolution in a meaningful layout. 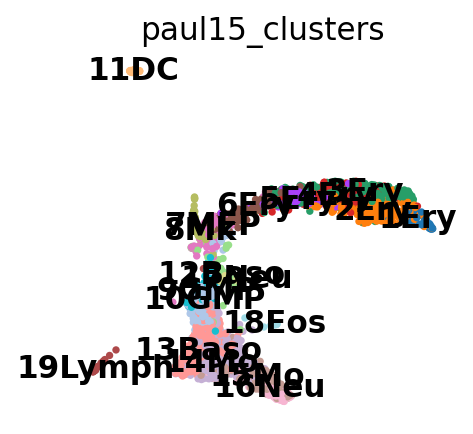 Choose the colors of the clusters a bit more consistently. And add some white space to some cluster names. The layout shown here differs from the one in the paper, which can be found here. These differences, however, are only cosmetic. We had to change the layout as we moved from a randomized PCA and float32 to float64 precision. Choose a root cell for diffusion pseudotime. Select some of the marker gene names. Use the full raw data for visualization. © Copyright 2019, Alex Wolf, Fidel Ramirez. Revision 7993e7c6.